Experience all the winter classics for photography around southern Iceland: ice caves, Jokulsarlon, icebergs, glacial lagoons, waterfalls, aurora borealis (weather dependent), glacier and ocean landscapes, reindeer, and above all, unparalleled chances to view the Aurora Borealis over spectuacular glacial backdrops! We'll have a busy schedule, filling our days and nights with rewarding photography opportunities around the island, while staying in excellently situated quality accommodations at night. Read below for a detailed itinerary and further trip information. After pickup in Reykjavik or Keflavik in the late morning, we depart the city for our upcoming adventure. We first visit the Golden Circle sight of Thingvellir National Park for its history and tectonic rift cracks. Then it's on to the blue Bruarfoss rapids, and famous Gullfoss waterfall. We stay right next to Gullfoss so we can photograph this popular area at sunset and sunrise a little more to ourselves! Hopefully later weather permitting, we'll go on a night/aurora shoot. Accommodation in Fludir/Geysir area. Sunrise at Gullfoss or Geysir depending on the light and what we already shot the day before for sunset. Then we'll make a couple stops at more waterfalls and farm or church type of scenes, making sure to stop by a field with the friendly Icelandic horses. Depending on the weather, light and time, we'll probably pass through Vik quickly and drive for a couple hours midday, getting to the Skaftafell glacial region for sunset light over the glacier of Svinafellsjokul. Sunset and possible auroras over Svinafellsjokull glacier. We'll backtrack to our accommodation for a bit, and today will be a long day. Return to Skaftafell glacier area, then we'll continue onto some introductory photography at Jokulsarlon glacier lagoon and/or iceberg beach areas and other nearby glacial lagoon Fjallsarlon. We'll either shoot sunset in the Jokulsarlon region and get to our accommodation in Hofn after dark, or shoot sunset over Vestrahorn, but either location will give us the chance to shoot the aurora borealis over the famous Vestrahorn mountains. Sunrise at Stokksnes peninsula and black dunes with Vestrahorn Mountain as our backdrop. Later in the morning we'll photograph some coastal and mountain secret waterfall scenes, characteristic of this part of the southern EastFjords. At this point, our itinerary starts working its way back westward, as Hofn marks the farthest point eastward we go. Then we take some rough roads to the remote spectacular glacial lagoons such as Heinabergsjokull, which we often have all to ourselves as if it is a private lagoon, while also keeping a lookout to spot any wild reindeer herds typically in this area. In the later afternoon we return to the Jokularlson lagoon area and position ourselves for a great sunset over the icebergs. Possible auroras reflecting over the Jokulsarlon iceberg lagoon or iceberg beach. Today is a full day from sunrise till sunset spent photographing around Jokulsarlon glacier lagoon region, and the famous iceberg black sand beach, which can provide hours of challenge and creativity as we photograph the ocean tides draining away from the clear ice chunks. Today will feature the glacial ice caves trip with local guide, which will take about 5 hours total. Possible auroras reflecting over the Jokulsarlon iceberg lagoon or iceberg beach. One last sunrise chance at the iceberg beach, then we return through the Skaftafell region and do any wrap up photography we missed earlier in the week. Other highlights in the region might include Svartifoss or Nuppstadir old turf covered farm sheds. We then head to Vik for the night, famous for its Reynidrangar seastacks and Dyroleay headland area for sunset and possible aurora locations. The other possible itinerary is that if we spent more time around Vik on day #2 and never made it to Skaftafell, then we'll stay the day in the region through sunset at Skaftafell, and get in late after dark to Vik this night. Vik seastacks or Dyroleay headland area for one more sunrise, and then the famous south coast area Skogafoss and Seljalandsfoss waterfalls, and another lesser known but spectacular waterfall Kvernufoss. 3 hours driving time back west to Reykjavik, and one last chance to photograph anything we skipped prior including Icelandic horses, Icelandic churches, mossy lava fields, geothermal power stations, etc. End of the tour upon return to Reykjavik, in the evening. Group Size: Maximum size of 8, minimum 3. Arrival/Departure: You must inform me of your arrival time to KEF. Airport transfer to your hotel is normally not included, and to be booked on your own. Please allow enough time for yourselves in Reykjavik, based on the trip itinerary. Accommodation in country hotels and nice guesthouses with ensuite bath and double occupancy. Single room upgrade is $80/nt extra. If non-elective, forced upgrade to single due to no suitable rooming partners, then a 50% subsidized single supplement fee is still charged. Single room upgrade is $80/nt extra. If non-elective, forced upgrade to single due to no suitable rooming partners, then a 50% subsidized single supplement fee is still charged. Accommodation/Single Supplement: Our included accommodation will be in comfortable country hotels and guesthouses chosen specifically for their location close to our photographic destinations, in twin rooms, with normally (but not guaranteed - depends on availability) private bath, shared with another trip participant if you're a single. Single supplement is $80/night for this trip; you must let me know specifically if you need a single room and wish to upgrade. If anyone is forced to upgrade to single room due to no suitable rooming partner of the same gender, then they will still be asked to pay a 50% subsidized single supplement rate. Packing: a packing list, which will be provided, has been fine-tuned over the years to include everything needed but nothing extraneous for a typical photographer. If you have questions about it, please let me know. I want to stress that simplicity is good, and please don't bring too much, as it just becomes a burden to carry around, transport, and won't be used. Also, while things generally stay dry, if you're very concerned, you may wish to pack things inside plastic bags in your suitcase. Special Dietary Restrictions: While traditional Icelandic meals include lamb and fish, if you are a vegetarian or have other special needs, please let me know ahead of time. There will be some group meals, and other meals may be ordered individually. Physical Fitness: This trip offers a fully packed schedule of sightseeing, photography and travel up to 13 hours a day, so a good travel attitude, high energy and enthusiasm is very important. We will not be hiking very far distances on the trip, usually staying close to the road, perhaps a 1 hour round trip walk at most, but we may be out in the cold and wind for several hours at a time. Additionally, it is important that you are generally comfortable and confident in walking in outdoor environments and terrain which may possibly be steep or muddy or slippery, else you may miss out on some photo opportunities by having to stay closer to the car. Icelandic Contact: Should you need to contact me last-minute, my Icelandic mobile phone number is +354 626 0292. However, please contact me by email for all but last-minute needs. This photo workshop is all about in-the-field field photography and situational instruction, working alongside your trip leaders. Each day, the group will photograph diverse landscapes and natural wonders of Iceland, in the quiet and peaceful setting of the Icelandic wintertime. In the evening, we'll occasionally have image critiques and editing sessions on clients' laptops. We will always being prepared to go out to photograph the Aurora Borealis should it occur. Aurora Borealis viewing depends on 2 main factors: solar activity and clear weather. A long trip through various parts of the country gives us the best chances to see and photograph this phenomenon. Photographic topics that will covered while shooting include nighttime and austral photography, Aurora Borealis photography, classic landscape photography composition and technique, HDR (High Dynamic Range) imagery, panoramic photography, adventure and travel photography, tilt/shift focusing, and slow shutterspeed effects. A maximum group size of 8 photographers ensures you will receive ample personal photographic coaching in the field from a full time working pro, and provides an intimate small group adventure experience. 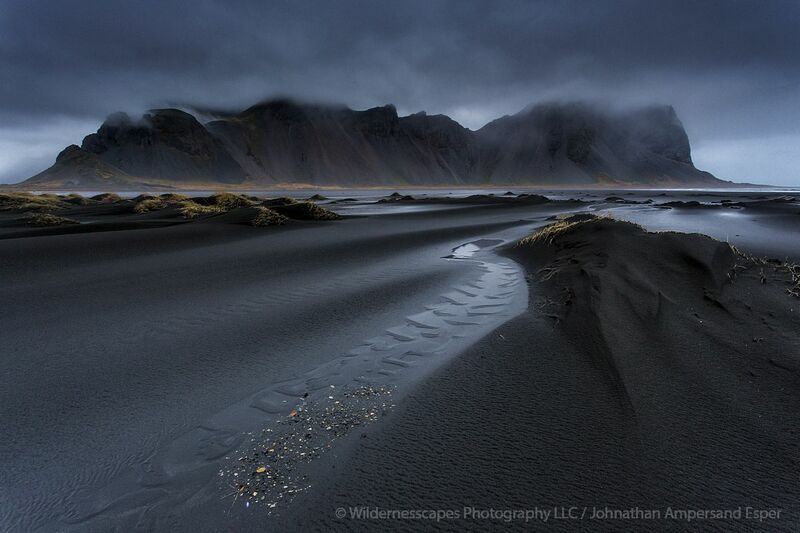 Johnathan Esper of Wildernesscapes Photography LLC in the USA is organizing the trip. Johnathan is a full time photographer and international photo trip leader, and has a unique background and an intimate knowledge of Iceland from exploring and photographing Iceland intensively for months at a time on his own and is also very experienced in leading workshops, having led 60+ very successful photography workshops around Iceland since 2011. He specializes in wide panoramic landscapes, adventure photography, classic landscapes, and aurora borealis austral photography in Iceland and the Adirondack region in the USA. Deposit: A $1,000 USD deposit is due at the time of registration, and the remaining balance is due 4 weeks prior to the trip start. Until payment is sent, your place is not guaranteed. For USA and Canada clients, we ask payment to be in the form of a personal check or bank check made payable and mail to: "Wildernesscapes Photography LLC", PO Box 326, Long Lake, NY 12847, USA. For European and other international clients, payment options include bank transfer to my Icelandic account, or credit card payment through my website. The deposit portion may also be paid via credit card for all clients regardless of country, without added fee. You may conveniently pay your deposit here (near bottom of page) securely with your credit card, processed by PayPal payment processor. Final Payment: The final payment for the balance due on the trip (after your paid deposit), is due 4 weeks prior to trip start, unless permission has been granted for payment in person upon meetup. Payment via personal check is requested for USA and Canada clients. International clients including European may pay with bank wire transfer, or credit card. Please note: For all credit card payments for the final payment portion, I do charge an extra 2.5% surcharge to partially cover my cost of accepting cards for the final payment portion. This can be paid on my website through Paypal. I can also accept cash currency at trip start in any major currency, with USD or ISK preferred, or with 2.5% currency conversion fee added for EUR, CAD, GBP, or others. Cancellation Policy: In the unfortunate case if you need to cancel, the cancellation policy is: Deposit payments are refundable as 80% future scheduled trip credit up to 120 days before trip start, 50% future scheduled trip credit if cancellation is 120-60 days before trip start, and non-refundable less than 60 days before start. Final payments for the full trip balance are 100% refundable until the trip start, and non-refundable after the trip start. If I am able to fill your empty spot on the trip, half of what you'd lose will additionally be returned to you, for all the above situations. If the trip is cancelled for some major reason, such as overwhelming volcanic activity, trip leader health crisis, etc, then I fully refund everything in cash or PayPal or bank transfer, or a pro-rated amount if the trip must end early for the same reasons. If the trip leader is unable to perform his duties, of course a substitute leader will be sought, and overall trip cancellation is a last-resort. I am not responsible for reimbursing you for travel or other ancillary expenses you incur in prep for the trip. Liability Waiver: I do require a signed liability release from all trip participants signed by the trip start. I can send a copy for your review if requested. If you do not wish to sign the document, and as a result wish to cancel your trip, that's fine, but my standard cancellation policies still apply. Trip Insurance: I do require that all trip participants have at least a basic level of international trip insurance which also covers medical care, or else their home plan that covers them abroad also. Travel insurance isn't expensive, and I recommend the travel insurance comparison website squaremouth.com, where you can find a 2 week policy for as little as $25. Please note that I do have an Icelandic commerical drivers license for legal purposes and safety. This trip is being formally run, for legal purposes, through my USA-based business Wildernesscapes Photography LLC.